The first time I ate at Bar Tartine in San Francisco, I noticed a particularly dark spicing and foreign sense of boldness to chef Nicolaus Balla’s hearty style of cooking. I recall unique combinations of flavors, that, although were not common, were not entirely unfamiliar – beef tongue under a canopy of tart purslane, with radishes and fried shallots; lentil “croquettes” (basically, lentil falafels) with hatch chilies and sprouts drowned in house made yogurt, slightly sweetened with sour cherry molasses; smoked and blistered potatoes with ramp mayonnaise; and langos – a potato fry-bread, drizzled with sour cream and dotted with dill (the herb that holds the key to my heart). And, of course, there was Chad Robertson’s amazing bread from Tartine Bakery. Balla buttered slices of Tartine’s kamut bread and topped them with shavings of bottarga, clusters of crunchy dulse, and fleshy bolete mushrooms. That was really delicious. When I asked my server where chef Balla had cooked before, I was told that he drew a lot of inspiration from the years he spent as an adolescent in Hungary. I’ve been to Hungary and tasted the dynamic mix of Eastern and Western flavors there, and, having that context really helped me place and appreciate Balla’s cooking at Bar Tartine. That first visit to Bar Tartine last year had me hooked. Since, it’s quickly become one of my go-to spots in San Francisco for a quick lunch, or a casual night out with friends. 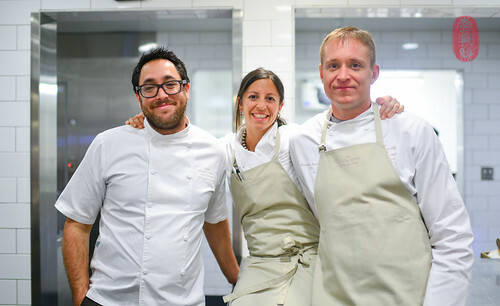 I was particularly thrilled when Christopher Kostow announced that Nicolaus Balla and his co-chef Cortney Burns, would be cooking at this year’s Twelve Days of Christmas at The Restaurant at Meadowood. Balla and Burns brought their dark spicing and foreign sense of boldness to Napa Valley. And they brought amazing bread too; lots of it. 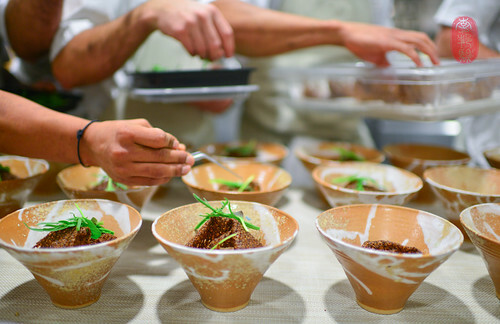 They paved silky beef tartare onto fluffy strips of koji bread, along with potato cream, bottarga, and cress. They served sprouts and grated blue cheese in an inky red mix of beet and apple juices. They made turo cheese – a soft, Hungarian cottage curd – and served it warm with some paprika purée. Together, the two tasted just like pimento cheese. They also steamed the curds into a soft round that had the delicate, spongey texture of quenelles. This, they served with a spot of warm mushroom broth. In a panel discussion at the Twelve Days of Christmas with Balla and Burns, they mentioned how their cooking focuses mostly on vegetables, using meat more for flavor rather than as a showpiece. 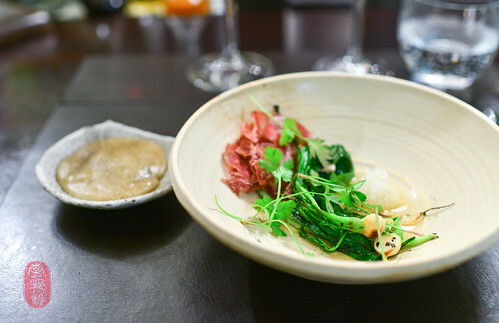 We saw this in a dish of charred greens that they served – there were Chinese broccoli and baby turnips – with thin shavings of air-dried beef (they get their beef from Mindful Meats, which gets their meat from pasture-grazed dairy cows). On the side, they served a dish of smoked potatoes whipped with marrow fat, a modified version of the smoked and fried potatoes with ramp mayonnaise that I mentioned above (it’s a Bar Tartine staple). The bitter char on the greens and the smoke in the potatoes paired especially well with the El Molino Pinot Noir, Rutherford, 2006 that was poured alongside this course. I really loved Kostow’s lobster dish at this dinner. He coupled velvety lobster tartare with cauliflower cooked in buttermilk. Over this, he tented tuiles made from flax seeds, which he topped with caviar. Together, it was creamy, crunchy, salty, and a tinge sweet from the lobster meat. It was great. To celebrate Tartine’s bread-baking tradition, Kostow baked entire guinea hens in sourdough rounds. The birds were carved, and the tender, juicy meat – a mix of white and dark – was served with dumplings (made with fat, thickened with kudzu) and a light, guinea hen broth. With that dish, Kostow served torn pieces of the sourdough loaf, which had a sturdy, golden-brown crust on one side, and a moist, flavorful mie – glistening with schmaltz – on the other side. To complement Balla’s and Burns’s cheese dishes, Kostow spooned whipped, funky Epoisses cheese over sweet apriums. 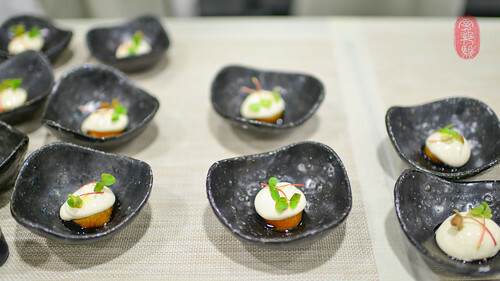 It was a wonderfully light, two-bite transition into dessert – a steamed parsnip cake, with cider molasses and kefir, made by Cortney Burns. The entire menu from Nicolaus Balla’s and Cortney Burns’s dinner, with wine pairings by the guest vintner El Molino Winery, is below, along with a slideshow from the tenth day of Christmas at The Restaurant at Meadowood. If you would like to see the photos in a larger size, click through the slideshow to the Flickr album. Potato, katsuobushi, grated mullet roe, cress. Flax, cauliflower cooked in buttermilk, caviar. Tartine bread, paprika, mushroom broth, curds. Fat dumplings, dried vegetables, caraway. Cider, molasses, kefir, bee pollen. Photos: Hands plating lobster topped with a flax tuple and caviar; cook Adam Ross with the guinea hen baked in a sourdough round; Balla’s & Burns’s charred vegetables with air-dried beef and a side of marrow-whipped smoked potatoes; Kostow’s whipped Epoisses with apriums and rye; and Christopher Kostow, Cortney Burns, and Nicolaus Balla.